Leveraging a real-time machine monitoring system that ties directly into the machine tool can provide management with up-to-the-minute status reports as well as historical data. You can go one step further to bring automation together by having the machine data collection software communicate to the job scheduling software when machine downtime occurs, allowing the modification of your future job schedule. Management can improve machine productivity by reviewing data and measuring the results against uptime, downtime, and profitability. Many machine tool vendors are embracing technology that uses Ethernet for faster communication to the machine tool. Traditionally, mold builders have been limited to serial communication and direct numeric control (DNC) software for transferring NC programs. RS232 communication speed is measured using baud rate (speed of transmission in a number of characters per second). Most older machines communicate at 4,800 or 9,600 baud. Typically, mold and part complexities can take hours to transfer by an RS232 serial connection at those baud rates. By leveraging Ethernet or network speeds, measured at a rate of millions of characters per second, the transfer is accomplished in minutes. While some shops place a computer next to the machine to make this connection, DNC vendors are advocating the use of a server on the network to simultaneously communicate to machines, “streaming” the part program as they operate. Server use allows network administrators to manage, control and monitor the communications activity to the machines while enabling NC program backups for redundancy. They also can virtualize the computer environment with the DNC software should a disaster recovery be required. Network-based machines can also be managed by one application to support Ethernet functionality and control, as well as to manage, track and document all transfer types from any form of communication to the machine. The key to earning more prospective Tier 1 and Tier 2 suppliers is to demonstrate that your facility has a program in place to support best practices and align the shop floor to the top floor. To help with this, DNC software vendors have added features to track the data to text files, Microsoft Excel, HTML or databases such as Microsoft Access or SQL. Data includes the NC program revision control method, setup processes, quality documentation, drawings and real-time data capture. All of this ensures that the programs created, released and signed off on are the results of the parts created for the supplier. 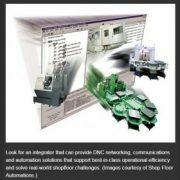 The success of robust DNC communications, machine monitoring, and specific jobs relies on shop floor infrastructure and connectivity. Today, wireless and Ethernet hardware are available for machine tool integration of any brand or type. For years, serial RS232 cabling was the only method for connecting the machine to allow for drip-feeding to the machine tool, which limited communication distance and reliability. By using Ethernet to serial adapters or wireless CNC adapters, users can often experience a fast communication speed to the machine, better reliability, and greater flexibility. These solutions will provide IT departments with ease of management as well as an understanding of how to bridge the shop floor to the company network. Manufacturers that are serious about streamlining processes and increasing productivity on the shop floor would be well advised to investigate the latest generation of solutions to help them attain both goals. Plenty of software options are available that can be tailored to specific applications by knowledgeable vendors.